Because I didn’t grow up “in the church,” I never really knew about tithing until I joined my first church family while in graduate school. My decision to tithe was one I made as an adult and I have observed the changes in my character that have occurred concurrently with becoming a cheerful giver. There is plenty of great content available about why one should tithe and how generosity is a mark of having been transformed by the Gospel, but that’s not what I’m discussing here. I don’t want to cover why someone should tithe/give, but rather give my personal motivations for tithing and giving generously. 1. I want to please God, and He has made this method very clear. We are called to be like Christ – not only is that a tall order, it is a totally unachievable one! There are very few areas where the Bible is so clear about any particular method of pleasing and serving God, but giving is one of them. The standard from the Old Testament was to give the tithe, or the first ten percent of one’s income. Jesus takes us beyond that OT standard to giving generously above the tithe. These are good benchmarks for a Type A rule-follower like me. We give the first 10% of our income as a minimum and strive to give as we see needs beyond that level. 2. I don’t want money to be an idol. Early on in my walk with Christ I identified two idols in my life (desires that compete with God for my worship). The first was my relationship with my boyfriend (now husband) and the second was money. I desire security and I can easily slip into thinking that my security comes from money instead of from God. By giving away money, I remind myself that it is not even in the same category as God in importance and I demonstrate my belief that God will provide for me. 3. I believe in the efficacy of my church. The great part of the money we give away goes to or through our local church. I believe that my church is effective in spreading the Gospel and transforming our city and, to a lesser extent, the world. It also ministers to and develops Christians, serves the underprivileged in our community, and donates money to evangelism and relief abroad. I am happy to give money toward this mission because I trust the vehicle. 4. I want to help people less fortunate than myself. I have been incredibly blessed with a wonderful family, stellar educational opportunities, good health, and a steady income. I want to use my resources to bless others, particularly the poor. Our giving to our church does that to some extent, but we also choose other community partners to support as we become aware of them or are asked. It’s important to also consider generosity of time and non-material goods in addition to money. This may seem like a weird example, but after I became a Christian I started donating blood regularly. I literally give of my body and I know that my sacrifice is helping to save the life of another person. 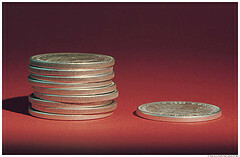 Giving cements in my mind that my money is not mine but belongs to God, and that my charge is to be a faithful steward. Why and to whom do you give? What keeps you from giving? Do you put any emphasis on giving anything other than money? 3 Responses to "Why I Tithe"